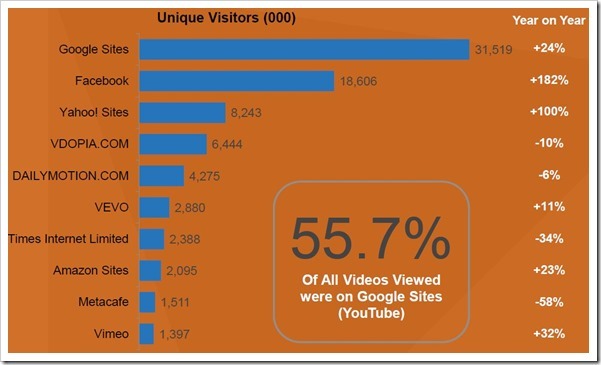 Internet Usage In India: 54 Mln Watched Online Videos, 86% Users Visit Social Media Sites! The “India Digital Future in Focus 2013” report by ComScore released today sheds lot of light on how Indians use internet on the PCs. As we mentioned in our previous article, India is now the third largest country for internet usage and she is expected to keep the growth rate for a foreseeable future, as internet penetration is still very low. Facebook’s dominance is so huge that an average user spends a whooping 217 minutes on Facebook, while the average time spent on 2nd most popular SM platform, Linkedin, is only 18.7 minutes. 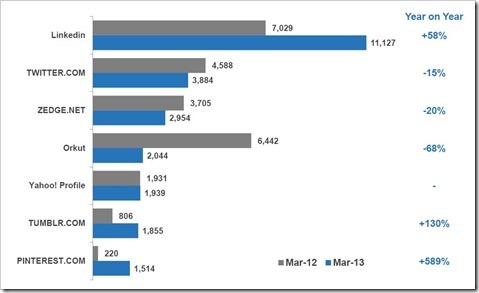 Linked clocked 11.1 mln users compared to twitter, which roughly has 3.9 million Indians on it. Interestingly, Twitter is has lost nearly 15 percent of India’s social networking market share and on the other hand, Linked has seen 58 percent growth rate. Orkut has all but vanished from India’s Social networking scene. However, new entrants like Pinterest and Tumbler are showing triple digit growth rate. According to Comscore report, 54 million users watched online videos from their Home or work PCs and growth of 27 percent over last year. Youtube is obviously the site of choice for Indians with 31.5 million users watching videos on it. However, with over 18.5 million users, Facebook’s is also becoming an important destination for Indians to consume videos. Facebook also clocked the highest growth rate of 182 percent compared to last year as compared to 24 percent growth for Google sites. Among the Indian content producers and Youtube partners, T-Series music was the most popular with close to 9.5 million users followed by SonyBMG at 7.3 mln. Reach of Online retail websites in India is 60.3 percent with Myntra being the most popular e-commerce site with 13.1 mln users visiting it. Flipkart has 12.6 million unique visitors. 56.8 percent of online population visited atleast one news or information site, however, compared to other countries, India has one of the lowest reach in this category. The most popular news/information destination for Indians were Yahoo sites, followed by Times of India. Interestingly, NY Times has more reach in India compared to HT Media or India Today! Blog sites are one of the fastest growing categories in India with a reach of around 49 percent. India’s travel category reach is one of the highest in the world with 38 percent as compared to global average of 36 percent. This is also primarily due to popularity of IRCTC sites. 13.7 million Indians visited Indian Railways website last year , and average spend was about 25.5 minutes per visitor. Makemytrip was 2nd most popular with a reach of 7.6 million users. Sports Category witnessed a reach of 26 percent, with cricket being the most popular sport being followed by Indians. As far as Real Estate Category goes, India has one of the lowest usage with only 8 percent population visiting online real estate sites. Magicbricks.com was the most popular attracting close to 1.8 million visitors. TRAI Will Now Penalize Operator Rs. 5000 For Every Spam SMS Complaint!